"George Kerscher has worked tirelessly for decades to promote accessibility and foster collaboration between organizations internationally. Since 1987, when he coined the term "print disabled," he has been dedicated to developing technologies and standards that make information not only accessible, but also fully functional, to those who are blind or have a print disability, and to help publishers understand that by doing this, they are making their content better for everybody. George is Chief Innovations Officer of the DAISY Consortium; Senior Advisor, Global Literacy, to Benetech; President of the IDPF; Chair of the DAISY/NISO Standards Committee; Chair of the Steering Council of the W3C Web Accessibility Initiative (WAI); and is on the Advisory Board of the Institute of Museum and Library Services (IMLS), a Presidential appointment. He has been an invaluable member of the BISG EPUB 3 Grid Working Group, heading up the Accessibility aspects of the Grid, and the Accessibility Working Group. He has been not only our lodestar on accessibility, he's the industry's. He is the very definition of Industry Champion. Plus he's a heck of a wonderful person, and Michelle Obama loves his dog." On June 30, 2016 George celebrated 25 years with Learning Ally. When he started in July of 1991, Recording For the Blind was the name of the organization. Learning Ally is the new name. "Learning Ally is doing great work," Said George Kerscher. However, George decided to transition to become an independent contractor doing work under "George Kerscher LLC." Successful succession planning at the DAISY Consortium saw Richard Orme become the CEO of the DAISY Consortium in May of 2015. George's role shifted to Chief Innovations Officer within the DAISY team. George said, "I am delighted to have Richard Orme take over as CEO. I am also delighted that I will continue working on standards and innovations within the digital publishing community." On May 7, 2012 , George Kerscher was one of fourteen individuals honored at the White House as Champions of Change for leading the fields of science, technology, engineering, and math for people with disabilities. "STEM is vital to America’s future in education and employment, so equal access for people with disabilities is imperative, as they can contribute to and benefit from STEM," said Kareem Dale, Special Assistant to the President for Disability Policy. "The leaders we’ve selected as Champions of Change are proving that when the playing field is level, people with disabilities can excel in STEM, develop new products, create scientific inventions, open successful businesses, and contribute equally to the economic and educational future of our country." See the video of the event at the White House. On December 6, 2011)The American Foundation for the Blind (AFB) announced the 2012 winners of the Migel Medals, the highest honor in the blindness field. The 2012 recipients are George Kerscher, Ph.D. and Kathleen Mary Huebner, Ph.D.
"It is an honor to present these medals to George and Kathleen for their outstanding achievements in the blindness and low vision field," said Carl R. Augusto, AFB president and CEO. "In dedicating their professional lives to ensuring that people with vision loss can live healthy and independent lives, the 2012 Migel Medal awardees are truly worthy of this special recognition." In August 2010, George Kerscher was nominated to serve on the Commission on Accessible Instructional Materials in Postsecondary Education for Students with Disabilities . The Commission will have up to one year to make recommendations to the U.S. Congress for improving access to and the distribution of instructional materials in accessible formats. In December 2009, George Kerscher was elected president of the IDPF, the trade organization that is setting the standards for eBooks and publications in digital formats. EPUB, is a trio of specifications that has been adopted in the publishing arena to deliver all types of digital publications. The challenge in the future will be to incorporate all types of content and to integrate rich media into the standards, while maintaining interoperability. Of course, access to digitally published materials must be fully accessible to persons who are blind and print disabled. 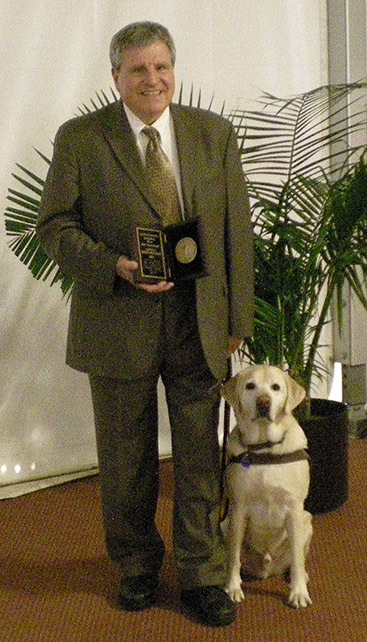 In August 2009, George Kerscher was elected to the Board of Directors of Guide Dogs for the Blind located in San Raphael, California. George with current guide dog Mikey, and retired guide Nesbit are graduates of Guide Dogs for the Blind, the premier non-profit organization in the United States providing guide dogs, training, and graduate services to persons who are blind. The IDPF membership has approved the EPUB maintenance working group. George Kerscher will act as chair and Garth Conboy will be vice chair. The area for the activity can be found at: http://www.daisy.org/epub/ The work will begin in August 2009. On July 10, 2008 George Kerscher, PhD received the 2008 Dr. Roland Wagner Award at the 11th International Conference on Computers Helping People with Special Needs (ICCHP) In Linz, Austria. The Wagner award is named for the founder of ICCHP, a pioneer in information and communications technology for people with disabilities in Europe. The award was presented to Kerscher for his tireless efforts to ensure equal access to information by people with print disabilities. Read the DAISY press release. On July 4, 2008 George Kerscher was named among the first recipients for the Dr. Jacob Bolotin Award which recognizes individuals and organizations working in the field of blindness that have made outstanding contributions toward achieving the full and equitable integration of individuals who are blind into society. The award was made at the 2008 National Federation of the Blind conference held in Dallas, Texas. More information about the Jacob Bolotin award Can be found on the NFB Web site. 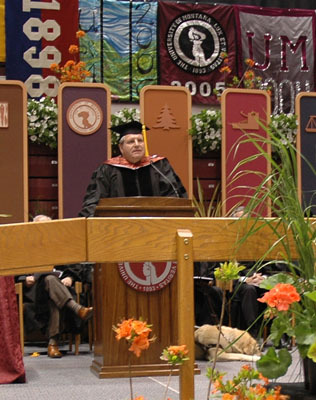 On May 12, 2007 at the graduation ceremony at the University of Montana, George Kerscher was awarded a Doctorate of Humane Letters, the highest honorary degree the University can bestow. The initiative was initiated from within the Computer Science Department. The recommendation received the unanimous endorsement of the CS Department, the University faculty, and the Board of Regents. 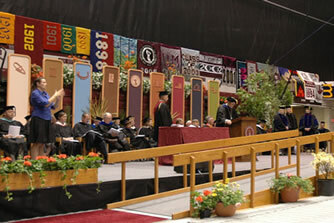 Two photos shown are of Dr. Dennison, President of University of Montana with George Kerscher to his right. The other is of George Kerscher making his acceptance speech. The recording is of Dr. Dennison's remarks followed by George Kerscher's acceptance. George Kerscher is wearing the graduation robe, cap and hood awarded as part of the doctoral process. Recording of George Kerscher's acceptance speech (MP3) Also A text transcription of the presentation. George Kerscher, who was one of the founding members of the Open eBook Forum (OeB), now the International Digital Publishing Forum (IDPF) was re-elected to the Board. George Kerscher was asked to serve on the Advisory Committee for the NIMAC. The NIMAC has been established as the repository for K-12 publishers to deposit XML files using the DAISY Standard that conform to the NIMAS guidelines for quality. More information about the NIMAC can be found at the NIMAC Web site. In September 2005, George Kerscher became the chair of the Advisory Committee to the DAISY/NISO Standard. As his first move as chair, he initiated a change in policy to open the committee's work to a broader audience and make the process transparent. A general call for participation by experts was broadly circulated and companies stepped forward making their best people available for standards work. The work plans and minutes will be available from the Z39.86's maintenance Web site. The 2004 Harry Murphy Catalyst Award was presented to George Kerscher at the CSUN Technology & Persons with Disabilities Conference on March 16, 2004. This biennial award is presented by the Trace Center to honor those who bring people together and facilitate the efforts of others in the field of technology and disability. Past award winners are Judy Brewer (2002) and Harry Murphy (2000). George Kerscher began working on document access in 1987 and has been a tireless advocate and leader ever since. He coined the term "print disabled" to describe people who cannot effectively read print because of a visual, physical, perceptual, developmental, cognitive, or learning disability, and believes that in the Information Age access to information is a fundamental human right. He also believes that properly designed information systems can make all information accessible to all people, and has worked consistently and effectively to push evolving technologies in that direction. Although his personal accomplishments stand on their own, he is receiving the award for the quiet work he has done advancing the efforts of others in this area. Never one to take credit to himself, he has helped foster and advance the work of many and brings out the best in teams that he is associated with. He has also spearheaded the creation of, and then quietly bore a large share of the support for, key groups that we have all come to rely on in this area. Find the press release at the Trace Research Center Archives. At the General Meeting of the DAISY Consortium, May 12, 2003 in Amsterdam, George Kerscher was voted to be the Secretary General of the DAISY Consortium. "Scope of Work: The Technical Panel has been charged with providing the Secretary of Education with a set of technical specifications to facilitate the efficient delivery of accessible instructional materials, a time line for the implementation of the proposed standards, and process for assessing the success of standards implementation. The Secretary of Education will publish the proposed standards in the Federal Register for public comment." On August 15, 2001, At a gala dinner as part of the International Federation of Library Associations Section of Libraries for the Blind (IFLA SLB) conference in Washington, DC, the CNIB Library for the Blind awarded the 2001 Dr. Dayton M. Forman Memorial Award to Ingar Beckman Hirschfeldt and George Kerscher. These two individuals, coming together from two different organizations on two different continents, have shown outstanding leadership in the development of the next generation of talking books, called DAISY (Digital Accessible Information SYstem). "No single effort in the past 10 years has so radically altered the reading experience of those unable to read print," said Rosemary Kavanagh, executive director of the CNIB Library for the Blind and chair of IFLA SLB. "Through the DAISY Consortium, the visionary capabilities of Ms. Beckman Hirschfeldt combined with the technical and managerial talents of Mr. Kerscher have resulted in a monumental change in the talking-book experience." For more information about the Dr. Dayton M. Forman Memorial Award visit:http://www.cnib.org/library/awards/dmfm/dmfm.htm. December 15, 1999 George Kerscher was elected to the Interim Board of the OeBF, by the leaders in the emerging Electronic Book Industry, and charged to establish a formal organization to promote the emerging eBook industry. Mr. Kerscher received the Keith E. Denton Member of the Year Award. This most prestigious and rarely given award is made to a member of the Association for exceptional service to the blind. George Kerscher was nominated and elected through a competitive interview process as Project Manager for the DAISY Consortium. The DAISY Consortium is the leading organization in the world developing information systems specifically designed for blind and print disabled persons. DAISY is devoted to developing the next generation of information technology for their consumers. The goal is to develop the standard for the "Digital Audio-based Information SYstem" (DAISY) for the world. Primary activity focused on E-Text, the new form of accessible book delivery, provided by RFB&D. In 1992 Mr. Kerscher completed a research project for the National Science Foundation that specifies computer file language standards for electronic books for persons with disabilities. The difficulty in this arena is mathematical and scientific information representation. In one file standard braille, large print and electronic access must be specified. Another objective of the R&D division is the development of software that makes electronic access to information easy and efficient. Soft copy technology offers the possibility of equal access by print disabled people side-by- side with the sighted community. This phase of R&D focuses on the delivery of that information to the print disabled community. 1996: George Kerscher was elected ICADD co-chair, to provide documents for people with print disabilities. He continued until its dissolution in 1997. Members of ICADD worked with early versions of HTML and other SGML specifications to ensure accessibility. Many of the members of ICADD were instrumental in forming the WAI, which carries on many of the activities that ICADD initiated. 1994 to 1995 Chair of the ICADD Technical Committee, which developed techniques to make documents accessible. Included in this work was access to mathematical and scientific information. The committee's work was primarily focused on the use of SGML for developing these techniques. They were incorporated in ISO 12083, Electronic Manuscript Preparation and Markup, and were in HTML 2.0. 1992 to 1994: Mr. Kerscher was the elected ICADD chairperson. 1994 Recipient of the American Foundation for the Blind's of "Equality of Access & Opportunity" award. Mr. Kerscher received this award for his contributions to the developments of electronic access to information for persons who are blind or visually impaired. This award was for Outstanding Contribution to the Blind and Visually Impaired of Idaho - Montana - Wyoming by the Association for Education and Rehabilitation of the Blind & Visually Impaired (Northern Rockies Chapter). The Texas Braille Commission requested Mr. Kerscher's service as technical representative to this commission. The purpose of the commission is to advise on the implementation of the Texas Braille Bill. The bill requires publishers to provide files to the state for production of braille for school children. The wider scope of the commission is to look at other aspects of education of the blind in Texas. The Texas Braille Commission adopted the standards developed by ICADD, as a requirement for publishers. Since 1996 publishers were required to submit computer files that comply with the standards developed by ICADD. At present more than 18 states have adopted legislation similar to what was pioneered in Texas. Mr. Kerscher was the founder and developer of Computerized Books for the Blind and Print disabled (CBFB). He developed the concept of computerized books for persons with print disabilities. In this formative time the concept and support was developed. He demonstrated to publishers and consumers the effectiveness of electronic books for braille production and for direct access via adapted computers. 1988-1989, coined the term "print disabled"
print disabled, noun. When used as an adjective, the word should be hyphenated, e.g. print-disabled person. Post graduate studies in Computer Science. Darby, Montana High School Chairperson English Department. Stevensville, Montana classroom teacher and manager of computer lab. Buffalo Narrows School District, Buffalo Narrows, Saskatchewan. Completed B.A. in English Education. The Soundproof Book: exploration of rights conflict and access to commercial e-books for people with disabilities. Kerscher, George, and Jim Fruchterman. First Monday, v. 7, June 2002. "Beyond Gutenberg", Janina Sajka and George Kerscher, 2000, American Foundation for the Blind.